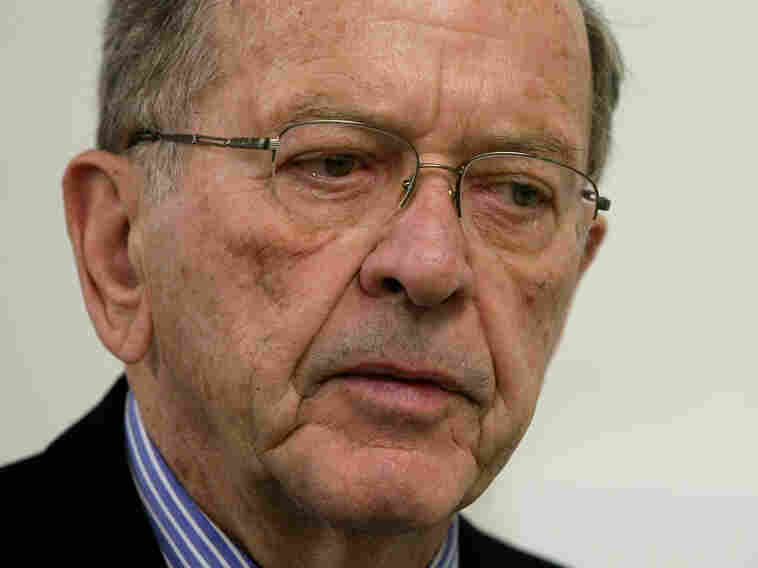 Report: Prosecutors Hid Evidence In Ted Stevens Case A blistering report finds the government team concealed documents that would have helped the late Ted Stevens, a longtime Republican senator from Alaska, defend himself against false-statements charges in 2008. Stevens lost his Senate seat as the scandal played out and later died in a plane crash. Then-Sen. Ted Stevens, R-Alaska, in 2008. An extraordinary special investigation by a federal judge has concluded that two Justice Department prosecutors intentionally hid evidence in the case against Sen. Ted Stevens, one of the biggest political corruption cases in recent history. A blistering report released Thursday found that the government team concealed documents that would have helped the late Stevens, a longtime Republican senator from Alaska, defend himself against false-statements charges in 2008. Stevens lost his Senate seat as the scandal played out, and he died in a plane crash two years later. The 500-page report by investigator Henry F. Schuelke III shook the legal community, as law professors described it as a milestone in the history of prosecutorial misconduct. Investigators weren't talking Thursday. But Brendan Sullivan, who defended the senator, had plenty to say. "The extent of the corruption is shocking," Sullivan says. "It's the worst misconduct we've seen in a generation by prosecutors at the Department of Justice." The report is based on a review of 128,000 documents and interviews with prosecutors and FBI agents on the hot seat. It details critical failings by the government as it raced to get ready for the 2008 trial: disheveled files; key meetings at which FBI agents never took notes; insufficient management by supervisors at the Justice Department's criminal division; and pained egos that led resentful members of the prosecution team to stop talking to each other in the weeks before the case went to a Washington, D.C., jury. For instance, the report says the Justice team argued to the jury that Stevens, who served the state of Alaska for 40 years, accepted pricey renovations to his Alaska chalet from oil services company executive Bill Allen. Prosecutors argued that the senator didn't disclose the full value of the gift on his congressional disclosure forms. There was a problem with that, though, defense attorney Sullivan says: "Sen. Stevens had a handwritten note to Bill Allen requesting that Bill Allen send him a bill. It was the heart of the defense because the note said, 'Send me a bill. We have to do this ethically,' " Sullivan recalls. But prosecutors reasoned that the senator was simply trying to cover his tracks, and they failed to turn over statements from a renovation foreman, Rocky Williams, who might well have supported the senator's account. They went on to present estimates about the cost of renovations that were wildly overblown, the report said. The government team also left the jury with a mistaken impression that Allen had been telling authorities all along that Stevens had cooked up a cover story about wanting to pay all the bills. But in fact, the report says, Allen didn't mention that in 55 previous interviews with prosecutors and the FBI — only coming up with the account that helped the Justice Department on the eve of trial. Finally, the report says, prosecutors should have shared information that might have obliterated Allen's credibility: an explosive allegation that Allen had a sexual relationship with a 15-year-old girl and then asked her to lie about it under oath. "It is incredible that in such an incredibly high-profile case, where a sitting United States senator is being prosecuted under the spotlight of the world with cameras watching and a top-notch defense team, that these kinds of egregious Brady violations could occur," says American University law professor Cynthia Jones. Jones is referring to Brady v. Maryland, a landmark Supreme Court case that instructed prosecutors to turn over evidence that would favor criminal defendants. The team prosecuting Stevens also ran afoul of another long-standing Supreme Court precedent in the case of Giglio v. United States. In the Giglio case, the high court said prosecutors needed to share evidence that would help defendants impeach the credibility of government witnesses. Everyone seems to agree the Stevens prosecution was infected with errors. The report blames higher-ups in the criminal division of the Bush Justice Department, Matt Friedrich and Rita Glavin, for failing to supervise the case. Friedrich didn't respond to requests for comment by email Thursday afternoon. Glavin said she didn't have access to the report or filings until Thursday and planned to comment once she had a chance to read through the material. But lawyers for the lower-level Alaska prosecutors singled out Thursday — Joseph Bottini and James Goeke — said investigators had been unfair. "The people who should be investigated and held responsible for the mistakes made in this case were the then upper management in the Department of Justice who, for political reasons, rushed this case to trial before the prosecution was prepared to try it," says Matthew Menchel, a lawyer for Goeke. "It was this decision ... that made it a fait accompli that the mistakes of the kind outlined in the Schuelke report would happen. Jim Goeke should not be made a scapegoat for problems that were caused by the upper echelon of the Department of Justice." Defense attorney Ken Wainstein spoke out on behalf of Bottini, who has been a prosecutor for 27 years. "The special prosecutor in this case looked at the mistakes that were made and, without any evidence and without any legal support, just concluded those mistakes were intentional misconduct," Wainstein says. "This is not about mistakes," countered Sullivan, Stevens' defense lawyer. "This is not about negligence. This is not about incompetence. This is about intentional wrongdoing," he told reporters. Stevens' former colleague in the U.S. Senate. Lisa Murkowski, R-Alaska, introduced legislation Thursday that would make clear that prosecutors are required to turn over evidence that would help criminal defendants. Their bill won immediate support from the American Civil Liberties Union, the National Association of Criminal Defense Lawyers, the nonpartisan Constitution Project, and a past president of the American Bar Association. The aftermath of the Stevens case has taken a toll on nearly everyone connected with it. A young Justice Department lawyer who spent years prosecuting Alaska corruption, Nicholas Marsh, committed suicide at his home in September 2010 as the investigation continued. The report expressed "no conclusion as to his conduct," given his untimely death. Robert Luskin, an attorney for Marsh, said "he tried to do the right thing." "We reject the contrary implications in the Schuelke report, which, like the very conduct that it purports to criticize, was the product of a well-intentioned, but ultimately misguided process," Luskin said. Brenda Morris and William Welch, who held leadership posts in the public integrity unit that prosecuted Stevens, were reassigned to other jobs in the Justice Department. The report made no misconduct findings about them — a fact their lawyers highlighted. Morris wrote a letter for the record that ended, "I trust that I can continue my legal career without further speculation as to my ethics or professionalism." Meanwhile, Edward Sullivan, a junior member of the Stevens trial team, is now prosecuting corruption cases again. The report says he "deferred to the judgment of his superiors and made no independent decisions" when it came to turning over evidence to the defense. His lawyer says Sullivan has been "exonerated." Attorney General Eric Holder, who abandoned the Stevens case in April 2009 after uncovering new and "disturbing" details about the prosecution, told lawmakers last week that the Justice Department had imposed sweeping new training courses on thousands of federal prosecutors to remind them of their legal obligations. He said the department has nearly completed its own ethics review into the debacle and that he hoped to make much of that review public later this year. And Sen. Patrick Leahy, D-Vt., who leads the Judiciary Committee, said he would ask Schuelke, who led the special investigation, to testify at a hearing before the Senate breaks in April — guaranteeing that the issues won't go away anytime soon. A previous Web version of this story reported in error that Sen. Richard Durbin, D-Ill., was a co-sponsor of a bill that would make clear prosecutors are required to turn over evidence that would help criminal defendants.